Appointments and Repeat Medication can now be booked and ordered online via EMIS Access. Please contact the surgery or speak with a receptionist for details. 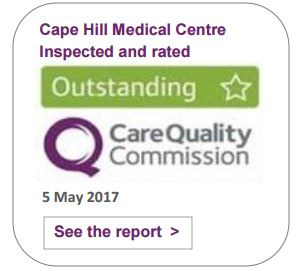 A general medical practice has been operating from the Cape Hill area for over 50 years. Formerly, the practice was located at 147 Cape Hill, originally the local brewery manager’s home, which became both the home and the surgery of the first GP, Dr Aiken. Since then, the practice has gradually developed to become one of the most comprehensive primary health care teams in greater Birmingham. This has happened on an evolving basis with the single-handed practice becoming a partnership after the war and a group practice establishing itself in the 1960’s and 1970’s. Since the later 70s and through the 80s and 90s, the primary health care team has become reality coupled with professional management and purpose-developed premises. Early in 2001, the practice relocated to a brand new private finance initiative-funded primary care building.